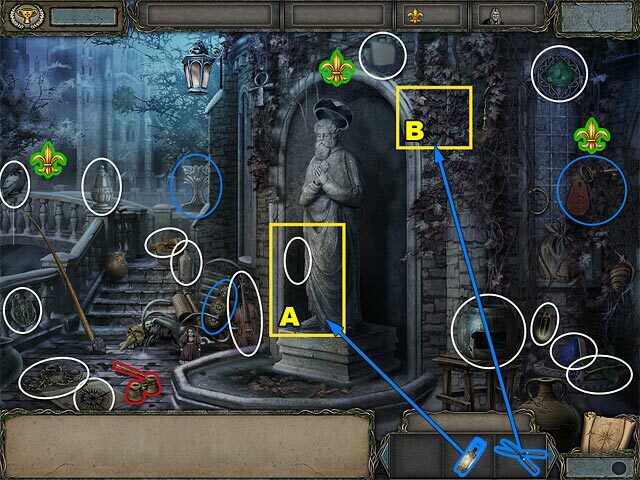 • Collect the LANTERN, SHEARS, and OCTAGON-SHAPED KEY highlighted in blue. • Go to the Temple Church. 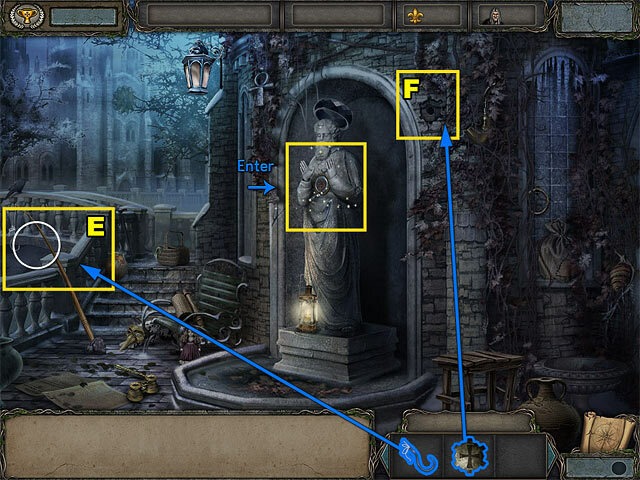 • Collect the SCRAPER, KEY, and ORNAMENT highlighted in blue. • Use the LANTERN to reveal the Templar's Cross (A). • Cut the branches with the SHEARS to reveal the keyhole (B). • Return to the Market Square. • Use the SCRAPER to get the Poster underneath (C). • Use the ORNAMENT to open the cage and get the Playbill (D). 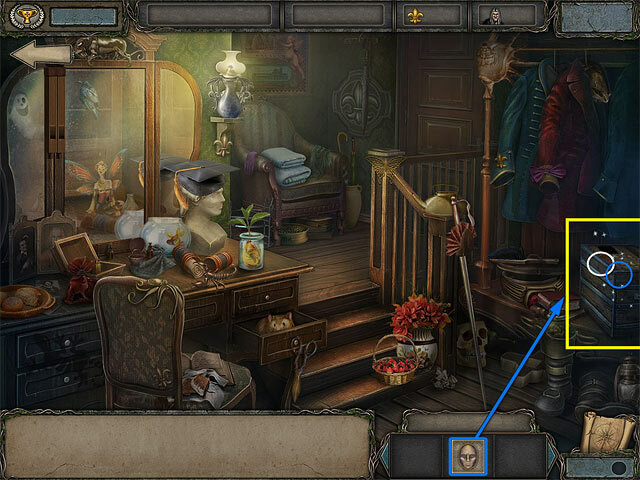 • Collect the CROWBAR, GEAR, and HOOK highlighted in blue. • Use the KEY to unlock the door the Dressing Room. 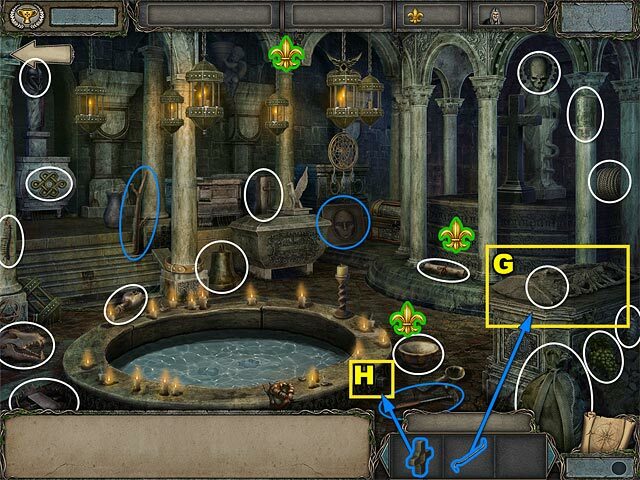 • Collect the SCISSORS, TETRAHEDRAL-SHAPED KEY, VALVE HANDLE, and ORGAN PIPES highlighted in blue. • You‘ll return to the Theater Foyer. • Use the SCISSORS to cut the bouquetwrapping and get the Card. • Go the Market Square. 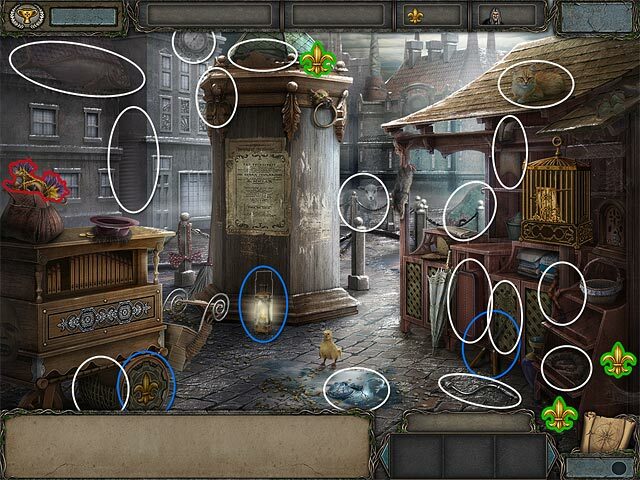 • Insert the missing ORGAN PIPES to fix it and collect the last hidden object. 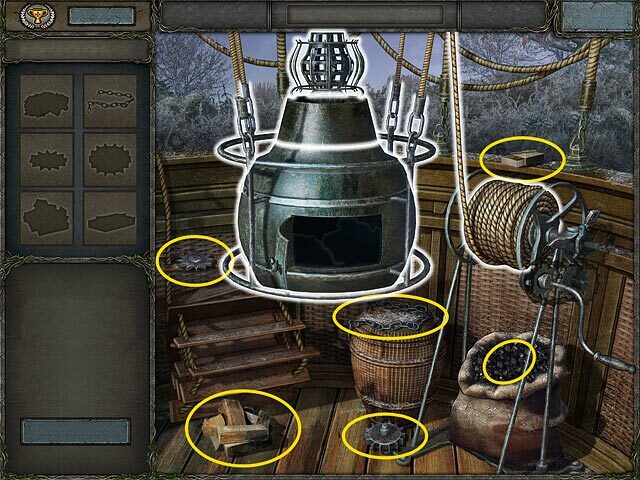 • Use the HOOK on the fishing rod to get the Fan (E). • Insert the GEAR into the slot to reveal the puzzle (F). 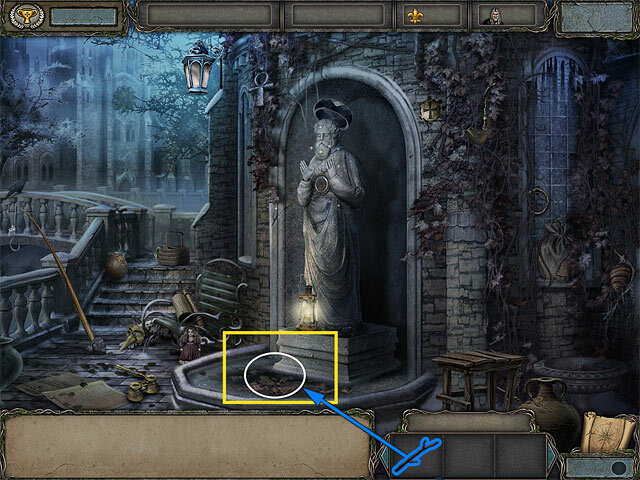 • Click the puzzle on the statue to play it. • Get the ball out of the labyrinth. • Use the arrows to move the ball. 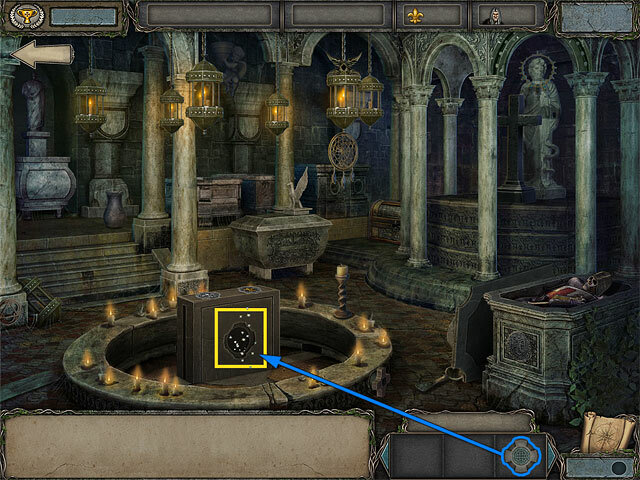 • You’ll enter the Temple Crypt. • Collect the STICK, HAMMER, and MASK highlighted in blue. 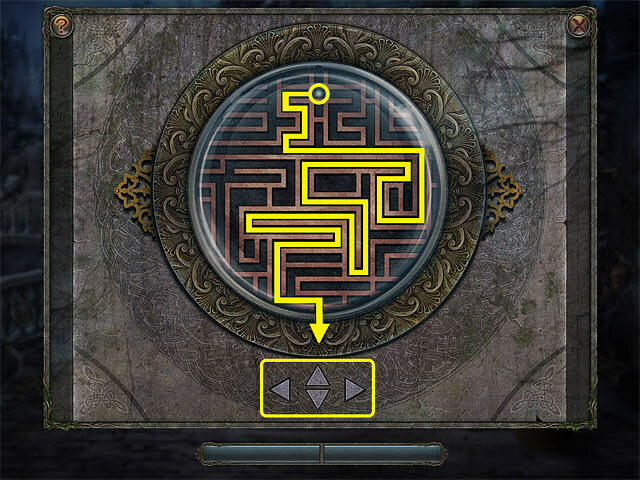 • Use the NAIL DRAWER to open the tomb and get the Compass (G). • Use the VALVE HANDLE to empty the pool (H). • Go to the Theatre and enter the Dressing Room. 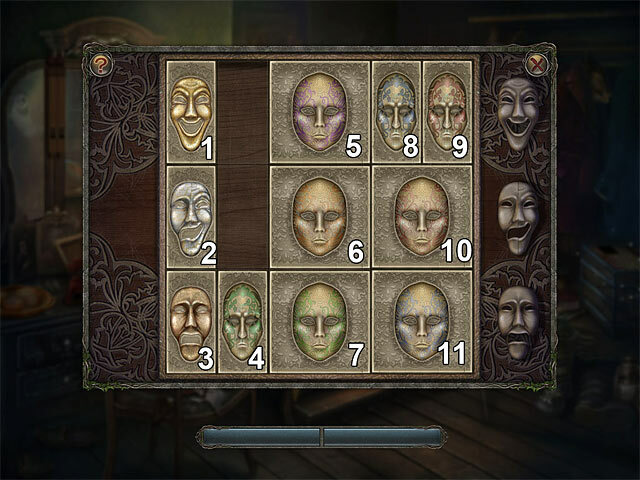 • Use the MASK on the chest to start the puzzle. 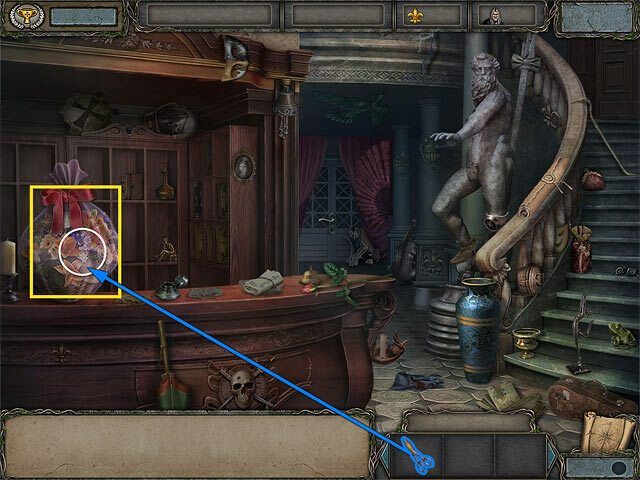 • Open the chest and get the Medallion and the CROSS-SHAPED KEY. 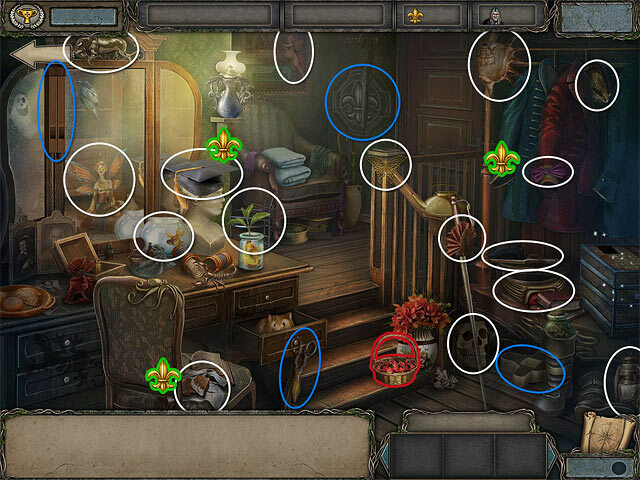 • Move the tiles with masks from the left to the right side so they line up with their counterparts on the far right. • Move 2 to the right and up. • Move 6 to the left border, move 5 down. • Move 2 and 1 to the right (to numbers 8 and 9). • Move 6 up, move 5 to the left border. • Move 10 to the left (to number 5), move 8 and 9 down. • Move 2, 1 and 6 to the right border. • Move 5 up and 10 to the left border. • Move 7 up, move 4 and 3 to the right (to number 11). • Move 10 down, move 7 to the left boarder. • Move 8 and 9 to the left (to number 7), move 11 up. • Move 4 and 3 to the right border, move 8 and 9 down. • Move 11 to the left (to number 7), move 4 up. • Move 3 to the right, move 4 to the left and down. • Move 2 down, move 1 to the right. • Take the Medallion and the CROSS-SHAPED KEY. • You’ll return to the Theatre Foyer. • Use the HAMMER to break the vase and get the Comb. • Go to the Temple Church and enter the Temple Crypt. • Use the OCTAGON-SHAPED KEY on the right keyhole (I). • Use the TETRAHEDRAL-SHAPED KEY on the left keyhole (J). • Use the CROSS-SHAPED KEY on the pedestal that slid out. 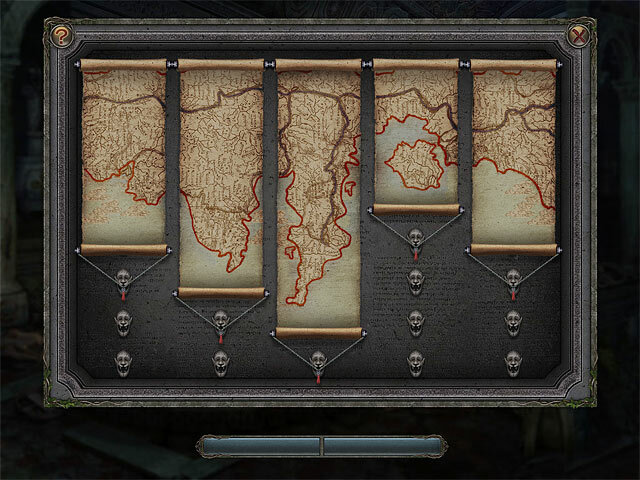 • Put each scroll on the correct knob to put the Map together. • You’ll return to the Temple Yard. 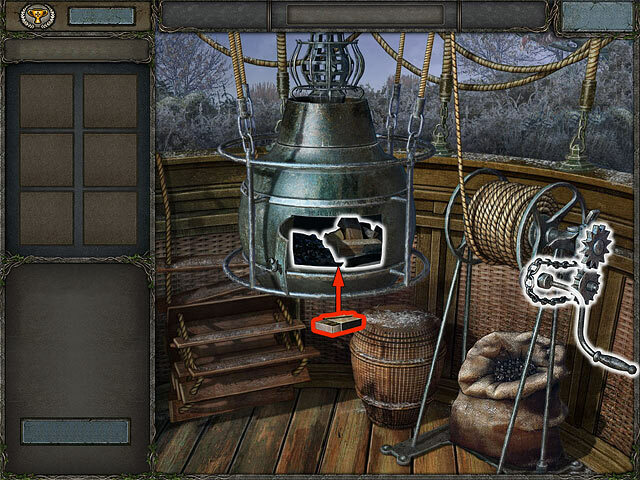 • Use the STICK to get the Flask out of the water. • Fix the hot air balloon by putting its parts in the right places. • Find the rest of the parts (highlighted in yellow). • Put the rest of the parts in the right places. • Use the matches to start a fire.